For over two decades in the film and video industry, Barbara Rosenthal has actively sought out projects that educate, inspire, and broaden our understanding of important issues. Rosenthal has lent her talents in a variety of areas – as a producer, director, writer, editor, narrator, and as a composer of film scores. A survivor of childhood sexual assault, Rosenthal was especially inspired by the work of her long time clients, Kelly Addington and Becca Tieder, founders of One Student. 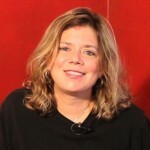 She approached Addington and Tieder with the idea for “You Are the One” in May 2011, and thus began this filmmaking journey. A 1987 graduate of Western Carolina University, Rosenthal lives in Tampa, FL with her life partner, Chris, and three happy rescue dogs. Her daughter, Hannah, is a third grade teacher at Community Roots Charter School in Brooklyn, NY.